The creator of an app that posted spam to peoples' Instagram accounts has said he made "a terrible mistake". 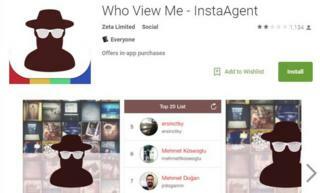 Turker Bayram's InstaAgent app was pulled from Apple and Google's stores after another developer flagged it was copying users' names and passwords for the photo-sharing service. But although InstaAgent used the logins, Mr Bayram denies saving them. One expert said sending the passwords to an unknown server was still "highly unorthodox". InstaAgent had topped the free app charts in several countries, including the UK, before it was blocked. The software promised to let users see who had viewed their Instagram profiles. But on Tuesday, David Layer-Reiss - a German iOS developer - posted a series of tweets that included evidence InstaAgent was "hacking" people's details. Mr Bayram failed to explain his actions when he was phoned by the BBC the next day, but later posted a statement online in broken English. In it, he said he had been working on a new way to promote the service. The app had charged people a fee if they wanted to see more than three people who had looked at their pictures. Mr Bayram explained he had been working on a feature that would have unlocked full access for free if device owners let an advert for InstaAgent appear in their feeds, but said he had decided not to activate it. "It was not a good idea," he acknowledged. "We didn't publish because we learned that Instagram wasn't allowing private APIs [application program interfaces] for third-party applications' usage." He added, however, that for reasons he "couldn't understand" the code still started posting the ads to some people's accounts. "It was a terrible experience for us. Because our application has removed both mobile markets," he wrote. But he said people who had downloaded the app should not be concerned. "Nobody's account [was] stolen. Your password [was] never saved [to] unauthorised servers. "But again and again we apologise... [and in the future] we must read service providers' policies carefully." Instagram - which is owned by Facebook - has advised users against using such bolt-on services. "Anyone who has downloaded this app should delete it and change their password," a spokeswoman said. Security consultant Alan Woodward added that he still had concerns. "Offering users an app to see who has viewed their profile is a classic way of scamming users into installing malware," he said. "For a third-party app to send your password to an external server is at best a way of circumventing the policy of that social media service. At worst it is simply a means of grabbing your password for nefarious purposes. "The particular way in which this app was sending user credentials to an unknown server seems highly unorthodox."